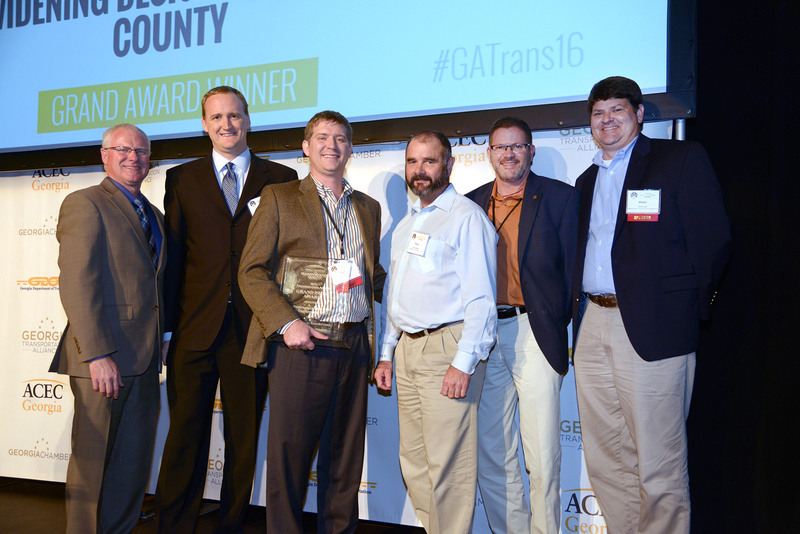 The American Council of Engineering Companies of Georgia (ACEC Georgia) has named Infrastructure Consulting & Engineering the 2016 Georgia Partnership for Transportation Quality (GPTQ) Preconstruction Design Grand Award Winner for the State Route 400 Widening Design-Build Project in Forsyth County, Georgia. Click the link below for a full story featured in Equipmentworld.com. This 14-mile long project includes widening the existing SR 400 from McFarland Parkway to SR 369 from a 4-lane roadway to three lanes in each direction. The project also consists of widening dual bridges over Big Creek and Sawnee Creek (Lake Laneir). The widening includes 11-foot wide travel lanes with an 8-foot wide paved shoulder. The design for this project was accelerated to provide ‘Release for Construction’ plans for a 4-mile segment within five months. ICE was responsible for preparing a survey database, final construction plans, and full erosion and sedimentation control plans.